» Appointments can be scheduled Monday through Friday. » If you are more than 10 minutes late to your scheduled appointment we will do our best to accommodate, however the appointment may have to be rescheduled. » If you need to cancel your scheduled time for any reason, please contact the office so that we can offer the time to someone else. Please try to give at least 24 hours notice. 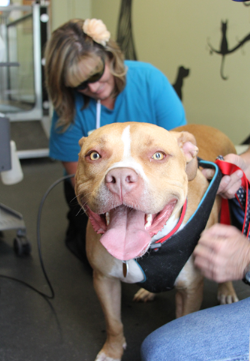 » If your pet is scheduled for a laser therapy treatment or time in the underwater treadmill they will not be seeing a doctor. If you would like to see a doctor, a separate appointment will need to be scheduled. » Patient care will be under the supervision of a licensed veterinarian certified in rehabilitation therapy, pain management and acupuncture therapy. Your pet's Primary Care Veterinarian will be updated on a regular basis and a summary of findings will be sent after your pet's initial assessment. Once therapy is complete your pet will be discharged back to their Primary Care Veterinarian for care. » Make sure your pet comes hungry to their appointment. We will use lots of food or treats as motivation and reward during their rehab session. » If your pet is on a special diet or has a favorite treat that they love, PLEASE bring a small bag with you that we can use during their appointment. » Be prepared to be put to work as your pet's personal cheerleader! We have found that the best motivation for a pet during treatment is encouragement from their family.